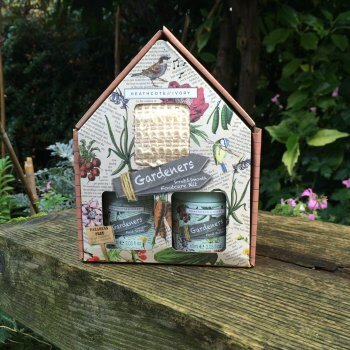 This Heathcote & Ivory gardener's foot care gift set from Ruddick Garden Gifts has everything a gardener needs to ease their tired feet after a hard days work. The gift set comprises of a 60ml tub of foot scrub which has been infused with cucumber and peppermint to cool and freshen along with natural exfoliating minerals to remove dead skin, blended with sweet almond oil to soothe and soften feet. There is also a 60ml tub of foot butter which has been formulated with natures hydrators beeswax, shea butter and aloe vera which blend with thyme and sage to refresh and soften the feet. The set also has an exfoliating foot cloth with handles.